Price per barrel of oil in dollars and euros over the last five years. Oil reached another all-time high today, topping $114 a barrel in global trading. The reasons for the rise are manifold, including new concerns from the International Energy Agency about supply shortages. But one cause of the high price is the depreciating dollar, which dropped again today in trading. When the dollar falls, oil prices rise because investors are more likely to use their money to buy hard commodities that won't lose as much value such as oil and gold. In fact, much of the rise in oil prices is due to a weakening U.S. dollar. 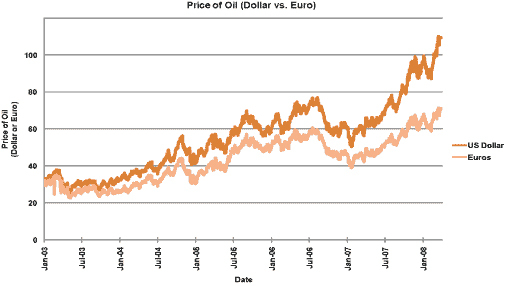 This chart shows the price per barrel of oil in dollars and euros over the last five years. The widening gap between the two lines indicates that 35 percent of the increase in the price of oil could be attributed to currency devaluation. Of course, the falling dollar is due, in part, to the rising price of oil. Meanwhile, the national average for gasoline prices in the United States also hit record highs of nearly $3.40 per gallon, with diesel fuel prices rising to $4.12 per gallon. Analysts say prices are unlikely to fall anytime soon, especially as the summer driving season gets under way in the United States.